Set just feet from the bay, family and friends now enjoy waterside views while lounging by this multi-tiered poolscape, outfitted with a hot tub, three water falls and an expansive outdoor dining area. On one end of the design, a verdant landscape balances the layout with exotic pops of colors and soft local trees and shrubberies. 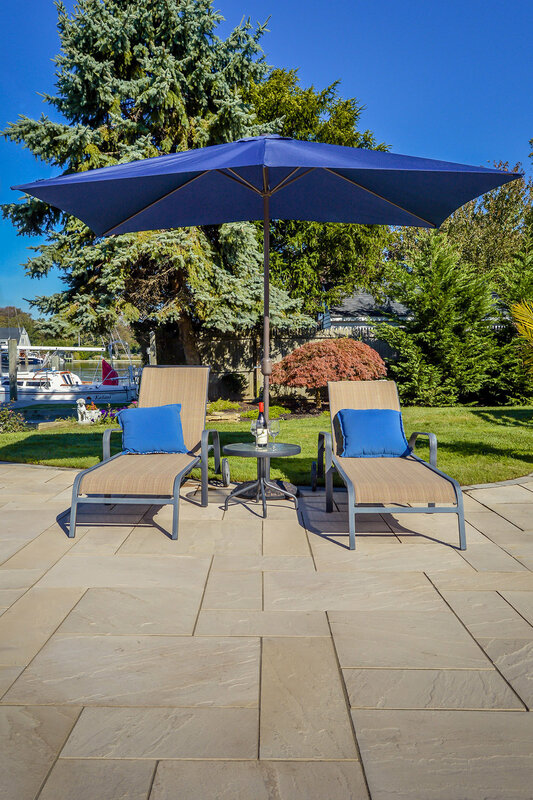 These blend seamlessly into the winding patio, fortified with Techo Blog Aberdeen in soft tans and grays. 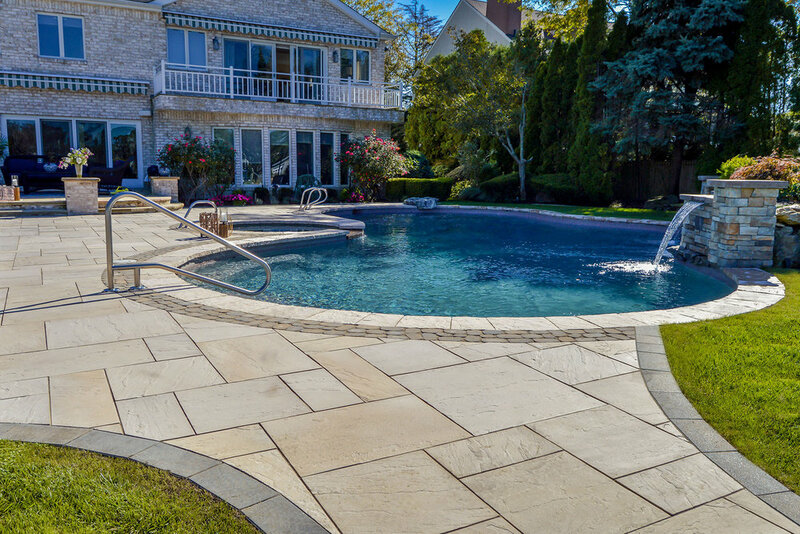 Cobblestone Techo Bloc Antica and 6X9 Hera stone borders the uniquely designed pool, sculpted to fit with the natural curve of the property. 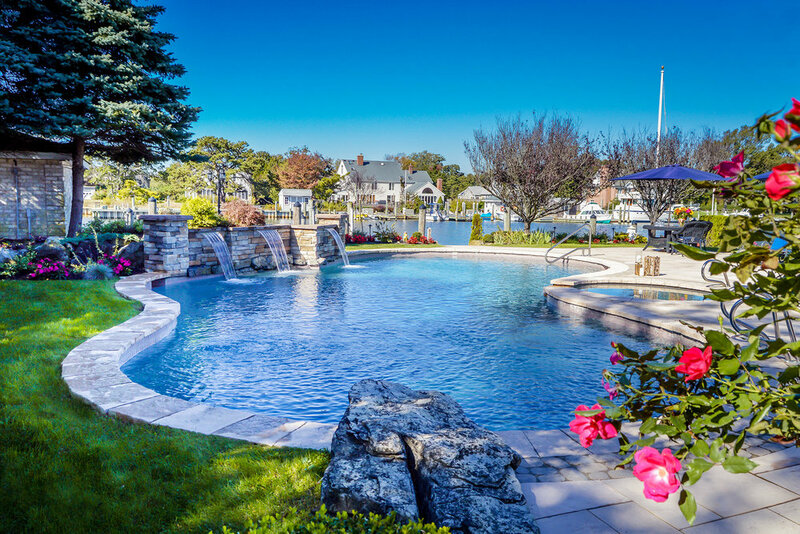 Accented at the head of the pool sits a large natural stone diving board. Above All Masonry designers created a space that supports ease and flow from the home to the patio by adding a raised stone seating area right at the backdoor. Guests then move along toward the pool's edge, enjoying ample poolside seating space that looks over the stone-stacked water falls and nearby bay. By incorporating the existent beauty of the space, this poolscape design communicates natural luxury and calm.